PORTLAND, Maine — A federal judge said Wednesday that he will rule next week on the Maine Republican Party’s bid to have a voter-approved ranked-choice voting system thrown out for the party’s two June 12 primaries, including a crucial four-way gubernatorial race. It’s perhaps the last legal gauntlet that ranked-choice voting must run before the June 12 primary, where Maine will become the first state to use the method after voters approved it in 2016 and the state’s high court cleared the way for it to be used in an April decision. The state party sued Maine Secretary of State Matt Dunlap in U.S. District Court in early May, after delegates at the state convention authorized a rule that called for gubernatorial and legislative candidates to be elected by a plurality as candidates have been elected in the past. The lawsuit affects two Republican primaries — the gubernatorial race between businessman Shawn Moody, former Maine Health and Human Services Commissioner Mary Mayhew, Maine Senate Majority Leader Garrett Mason and House Minority Leader Ken Fredette and a three-way Maine House of Representatives race in Turner, Leeds and part of Livermore. It’s urgent, with less than three weeks to go before Election Day. People around Maine have also already voted using the new ranked-choice voting ballot due to Maine’s in-person absentee voting law, which allows voters to cast ballots at least 30 days before an election. Joshua Dunlap, an attorney for the Maine Republican Party, argued on Wednesday that ranked-choice voting changes the internal workings of the party by potentially changing who the nominee is relative to the plurality system that Maine used since 1880. “There are very different candidates who carry very different messages and we see that play out each and every day,” he said. But Assistant Attorney General Phyllis Gardiner, who is representing Matt Dunlap, said there is no “severe burden” on the party, that it’s “unproven” whether the method would result in a different nominee and that the state is still allowed to regulate primaries. For now, ranked-choice voting will still be used in four races in the June primaries, including the Republican and Democratic nomination fights to replace the term-limited Gov. Paul LePage. 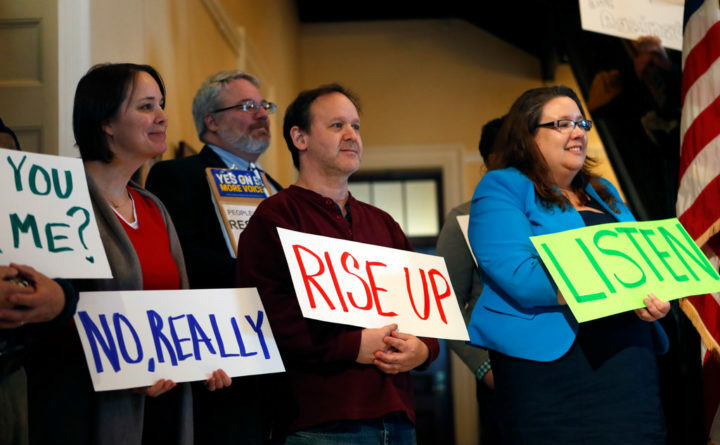 Mainers will also vote then on a people’s veto attempt that would nix a law passed by the Legislature last year that could delay ranked-choice voting until 2021 after previous constitutional concerns flagged by the state’s high court.